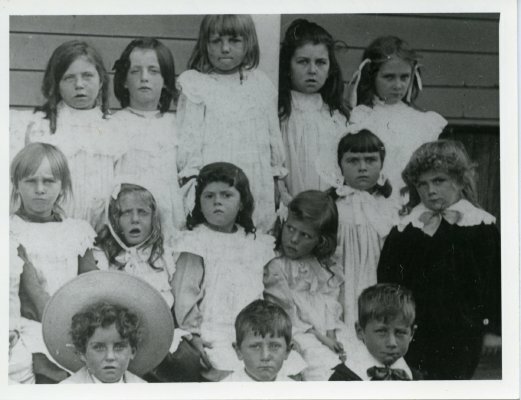 Description Invercargill Catholic School, taught by the Dominican Nuns, circa 1905. 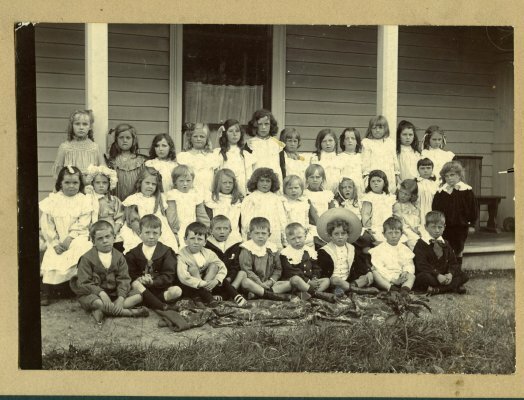 Sepia photograph of young school children, mounted on green card with beige paper. Right hand side of mount has been damaged. Back row: ? ; Vera O'Meara; ? ; Jamie O'Meara; ?; ? ; ?; ? ; ?; ? ; Fanny Shea; Tui Hall. Second Row: ?; ? ; Clara Planks; ?; ? ; Renee Smith; ? ; ?; ? ; George Wiggins; ? ; Dorothy Shea; ?Hall. Front Row: ? ; Frank haig; ?; ? ; ?; ? ; Harry Smith; ? ; ?. Smith's lived down the road from the Shea's. F. Shea second from right, top row. Dorothy Shea, second from right, middle row.